Canadian News : Falcon Tour Stop #2: The "Dancing Bear" Wins Again! Falcon Tour Stop #2: The "Dancing Bear" Wins Again! This past Labour Day weekend O'Black Jack Pool hall in Edmunston New Brunswick hosted the second stop of the 2016-2017 Falcon Tour. 15 players from Quebec joined another 15 local players to see who would take home top prize. Favourites in this field were Alain Martel, Danny Hewitt, Joey Cicero Tommy Theriault, Jeff Blais and Martin Daigle just to name a few. Three time World Speed Pool Champion and Canadian Champion Luc Salvas has been struggling a bit of late and did not have an easy first round draw. He was up against the resurgent Alain "The Dancing Bear" Martel who has been playing well and won the first stop of this tour. It was a close match but in the end Martel won 9-6. Throughout the first few rounds there was not to many surprises as the cream floated to the top of the bracket as usual in these events. In the third round winners side there were two notable matches to speak off. The first one was Jeff Blais vs Martin Daigle. Both hail from Quebec City and have met each other countless times in competition. Daigle got the nod here 9-8. Another match that could have gone either was was Tommy Theriault up against Joey Cicero. This match was intriguing as it pit two young pro's Cicero from QC and Theriault from NB against one another. Both players have the talent to be included in the handful of players in Canada that can be a threat internationally in the future. This match did not disappoint as it went right down to the wire with Theriault winning 9-8. Theriault went on to win his next match against Martel 9-8 which guaranteed him 3rd place. In the other final 4 side match-up a bit of an upset occurred as Martin Daigle defeated Danny Hewitt 9-7. Hewitt won nearly half of these events last year in dominate fashion so this was a good win for Daigle. In the winners side final it was another tightly contested affair. Daigle was able to secure the win 9-7 and found himself in his first Falcon Tour Final. Alain Martel defeated Yan Lalande who had an impressive tournament 9-6 in the 5/6 bracket. Next for Martel was his old rival Danny Hewitt and surprising no one, this match went right to the end with Martel winning 9-8. In the losers side final Martel had a shot at revenge against Theriault and he took full advantage winning 9-5. Going to the losers side seem to help Martel as he caught a gear and won the final easily 11-5 and took home his second win on the Falcon tour in as many tries. Congratulations to Martel for his win as well as Daigle and Theriault for their great performances. The next Falcon tour stop will be September 17-18 at Dooly's Valleyfield which is also Luc Salvas room. Each pro event at this pool hall usually is a spectacle all too itself as it is one of the nicest pool halls in the area. Cue Sport Nation will be in attendance I look forward to seeing you all there. I would like to thank Luc Paquette who is a vital member of the Falcon Team. He writes all their articles for the french website www.rds.ca and he gave me all the information necessary to write this article. 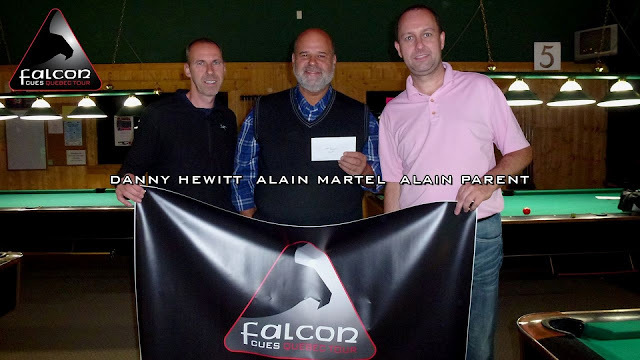 Also Thank you to Danny Hewitt and Alain Parent co-founders of the Falcon Tour for everything they are doing locally for pool.